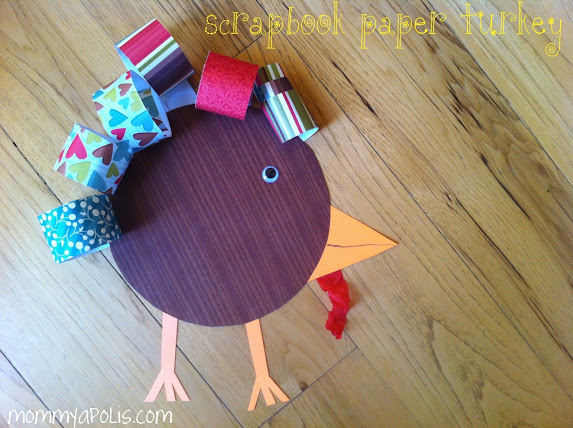 This morning the boys wanted to do another turkey craft. I kid you not when I say we have an entire wall of turkey crafts :)… I’ll post a pic of the “Thanksgiving” wall on Facebook! I see why they don’t want to eat turkey now :). This craft can be done with any kind of paper or even a paper plate if you want. We just did scrapbook paper because it made them a little more colorful. 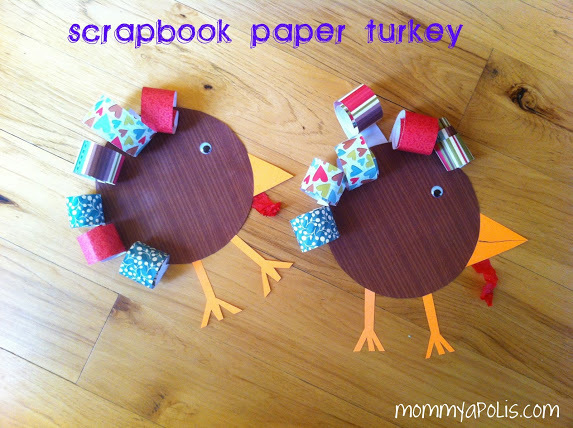 I’ve made these turkey’s before using construction paper in all different colors for the feathers- also very cute! You could also just use white paper and let them color the body brown and decorate the feathers how ever they want! Do what you can! 1. Cut out a circle shape for the body… I trace an ice cream bucket lid :). 5. Glue him all together!